KeyCue is now distributed as an Apple-notarized application. Custom menu entries can now be added to specific submenus. Fixes an invisible diagnostic field in the Settings window in dark mode. Removes a confusing reference to an older version in the "New in KeyCue" window. The KeyCue menu bar icon now uses the correct accent color when clicked. The info line in contact mail contains information about the system language and dark mode. Improved support for update checks in intermediate beta versions. Internal improvements of the Keyboard Maestro interface. Adds flag of the United Nations to the Emoji table. Cleaned up unused 32-bit code in the built-in installer. Troubleshooting function for resolving certain support cases. Improved internal caching of shortcuts. The URLs in the pre-installed URL collection now use secure connections to our server. Improved calculation of Emoji metrics. Improved visibility of the menu scanning progress in Dark Mode. The menu bar icon's pull-down menu now has the correct appearance in Dark Mode. Fixes a problem where the horizontal spacing of emoji symbols was too wide. Works around a problem with temporary folders that caused installations and updates to fail in certain circumstances. Works around a potential freeze in Luminar. Next story IINA 1.0.1 – Modern video player. Previous story HandBrake 1.2.0 – Versatile video encoder; convert any source to MPEG-4 and more. 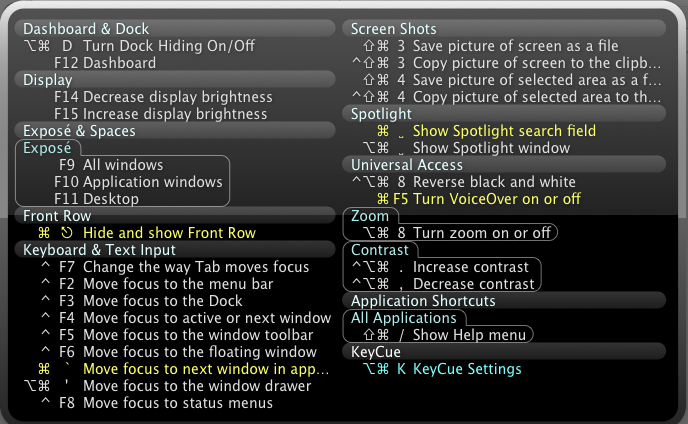 KeyCue 7.4.1 – Displays all menu shortcut commands.